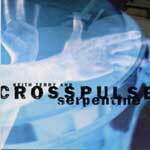 Crosspulse's second CD, released 1998. Featuring Edgardo Cambón, Claudia Gomez, Raymond Graham, Jackeline Rago and Keith Terry, with guest artists David Balakrishnan, David Belove, Bill Douglass, Andrew Lewis, Karl Perazzo, Susu Pampanin, members of Gamelan Sekar Jaya, I Wayan Sinti, Michael Spiro, Linda Tillery and the Cultural Heritage Choir. Produced by Keith Terry with Greg Landau and Dave Nelson. SERPENTINE was produced by Keith Terry, Greg Landau and Dave Nelson, and originally released on Ubiquity Records. If you like what Bobby McFerrin did to the voice, you will love what Crosspulse does to the drum. Most world music samplers and box sets don't cover as much ground, and few other global fusion bands execute their eclecticism with such attention to detail, such a combined sense of reverence and fun, and such a generosity of spirit. Shipping: US or International shipping costs will be added to your order when you check out, depending on your shipping address.